Registered mail posted in Dec. 1949 from Nepal to India. NEPAL" & " BRITISH LEGATION NEPAL"
India was divided on 14th-15th August 1947 at night. But the postal treatment towards Pakistan was finalised on and from 1st April 1948 only. The Postal administration of Persian Gulf countries i.e. Bahrain, Dubai, Kuwait and Muscat was handed over by India to British Post Office Agencies on and from 1st April 1948. 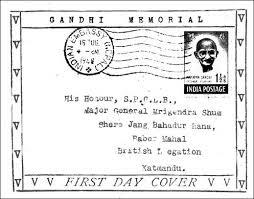 It is recorded in Nepal Postal History by Wolfgang that the Postal Markings were altered from British Legation (Nepal) to Indian Embassy (Nepal), in between 23rd April 1948 and 10th May 1948. It means that the change in Postal Cancellation took place after 1st April 1948 and it also means that if alteration would have taken place earlier, the cancellation would have appeared earlier. The Indian Embassy (Nepal) PO or British Legation (Nepal) PO or Residency PO was the name of the Indian Post Office in Nepal. The Residency PO started functioning in Kathmandu, Nepal in the year 1816. It continued till 1920 when it became British Legation PO, but postal markings were changed in 1941. After India's Independence the charge of this Indian PO was handed over to Indian Embassy in Nepal on 1st April 1948, and the postal markings were changed in between 23rd April 1948 and 10th May 1948. It was closed on and from 12th April 1965. Fully Prepaid Unregistered correspondence namely, Letters, Single Post Cards, Printed papers, Business Papers, Samples and unregistered News Papers could be sent by the Post offices in India to Nepal through the offices of Exchange. Reply Paid Post Cards, Money Order and V. P. Post Services were not available between two countries. Registration, Insurance and Parcel Service were also not available throughout Nepal except kathmandu where Indian Post Office - Indian Embassy PO Nepal was working. It means that Parcels within a limit of 400 tolas, Registered and Insured articles, addressed to and/ or care of this Indian Embassy PO, could be accepted. In case the addressee is not a member of the Indian Embassy, the Registered and Insured articles were handed over by the Indian Embassy (Nepal) PO to a representative of the Nepalese PO at Kathmandu, under acquittance and the later effects delivery. The above rules are recorded in Section XII of P & T Guide July 1948 and clarification there after are recorded in DGPO Circular No.49 dated 29th November 1949.